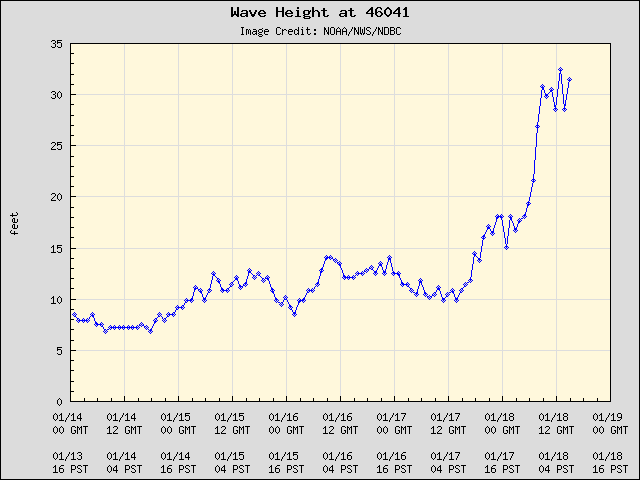 Buoy 50, right off of Newport, Oregon, got to 35 feet this morning. 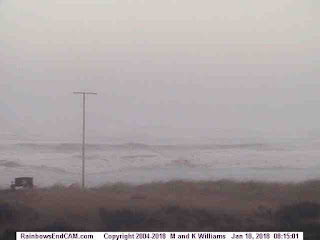 And a Westport surf cam shows an angry sea. 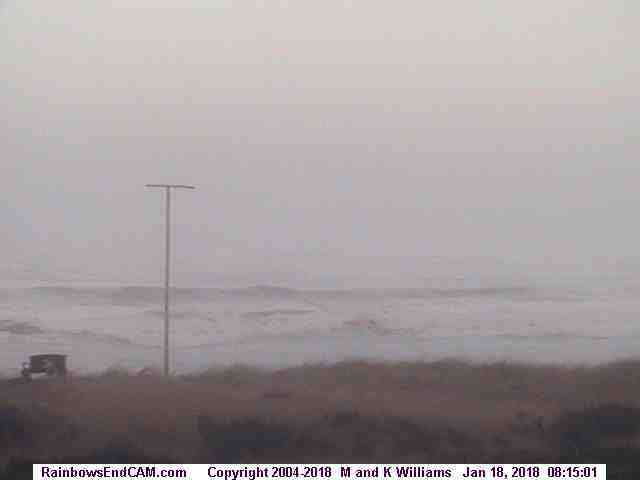 My colleagues at the National Weather Service currently have coastal flood and high surf warnings up for the Washington and Oregon coasts. 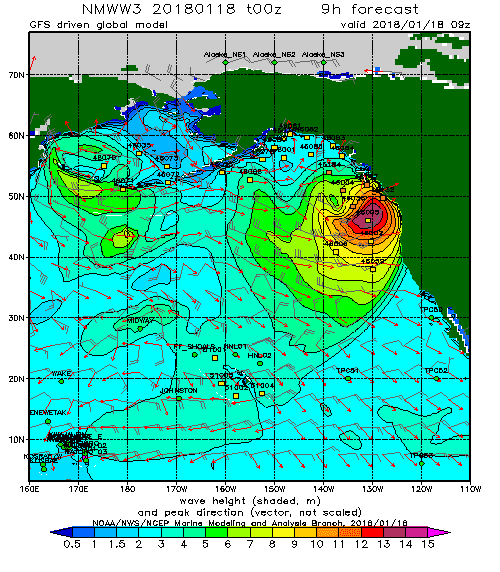 The National Weather Service runs a wave prediction model, called WaveWatch III, the predicts wave heights (using weather prediction models to drive the wave model). 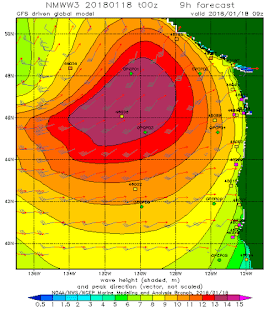 The WW3 forecast of significant wave height for 1 AM last night predicted a slug of very high waves of 13-14 meter height (43-46 ft) approaching our coast. No wonder my friends at the National Weather Service had warnings out! 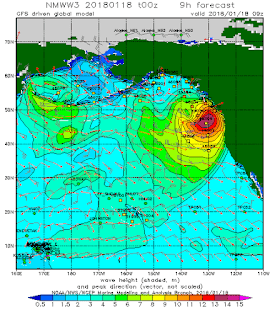 Here is a blow up of the predicted waves at the same time. 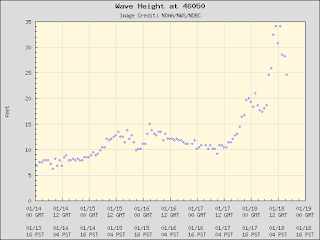 Why such big waves? Because there is a HUGE, intense, and slow moving storm (midlatitude cyclone) over the northeast Pacific. I mean a stunningly big storm. 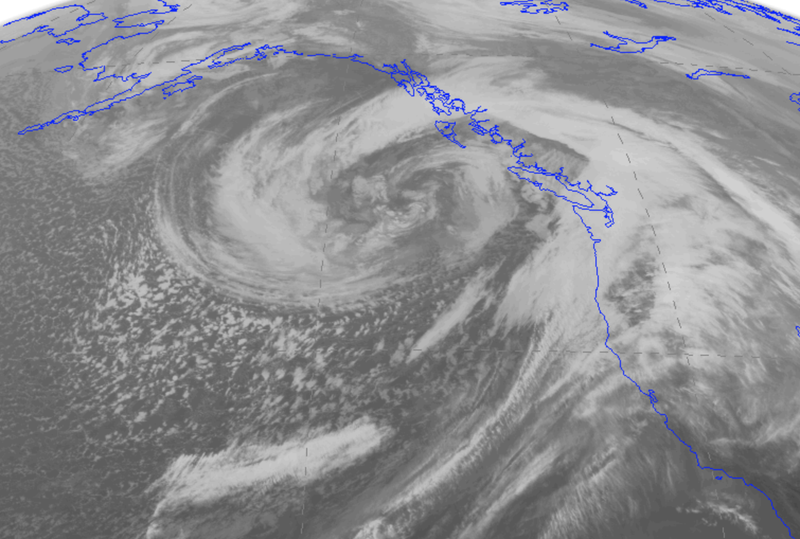 Here is an infrared satellite image last night...you can see the immense swirl of clouds circling the system. The sea level pressure analysis at 4 PM Wednesday shows the extraordinary system, with a central pressure of 964 hPa....very deep for a low that far south. You notice the extreme pressure gradients around the storm, particular on the south and west sides? Those are associated with very strong winds. In fact, the surface wind forecast from the UW WRF model for 7 PM Wednesday, indicates SUSTAINED winds of 50 knots around the south side of the storm. Wind waves depend on the strength of the winds, the distance the winds are blowing over the water (the fetch), and the length of time the winds work on the water. With a huge, intense, slow-moving storm like this, all of these elements are maximized to produce big waves offshore, which propagate away from the storm (and towards us) as swell. 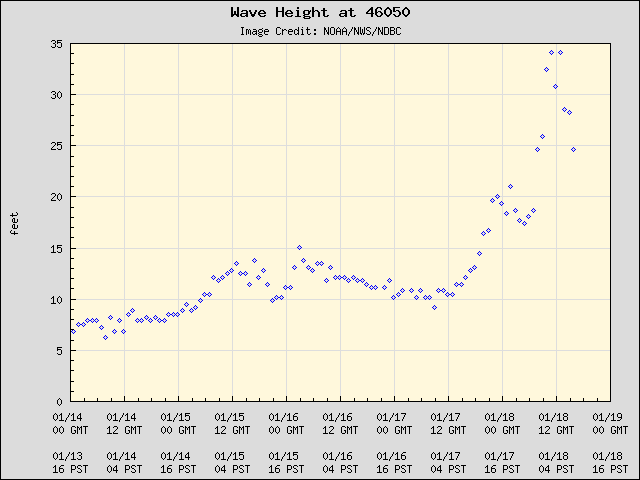 Be very careful if you go wave-watching on the coast. Sneaker waves can come in and inundate previously dry locations. 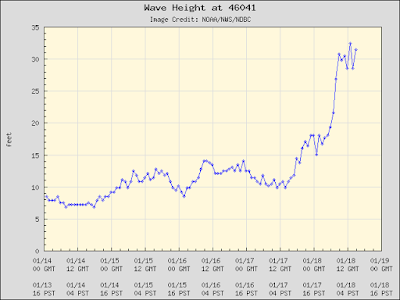 Too bad it's got so much south in the swell otherwise the straight of Juan De Fuca would be going off surf-wise for both the washington and BC side. Very dependent on a mostly west swell, a little north is good too. But the big west and northwest sells seem to be occurring less and less frequently in the winter with big south-west being more common... not sure the reason for that. Lots of warm air being affected into this area by this storm also, thus all the record maximums lately.Believe it or not,the average temp so far this January at Sea-Tac is warmer than that of New Orleans,LA. This must be the storm forecast to bring rain and snow (to the mountains) today through the weekend? 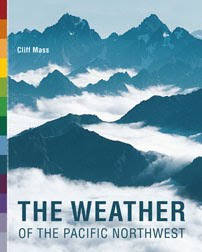 Will it be mostly missing us or are we only recently realizing its size and intensity? The reason I ask is that I don't see any winter storm warnings or watches posted for the Cascades or Olympics and only a few inches of snow at pass elevation and higher seem to be forecast at the moment. I hope you caught AFDPQR this morning! "Buoy 46029 reported a questionable 62 knot (71 mph) gust right as one of these thunderstorms moved over it at about 1250 AM this morning. While the report is a bit of an outlier, KLGX radar did pick up winds on the order of 55-65 kt at 4000 feet. 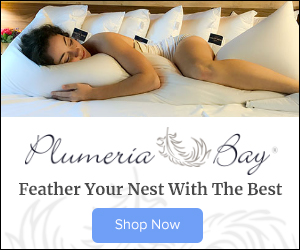 Whether or not these actually surfaced will likely be for only the buoy and perhaps a sea lion or two to know." Cliff,I am looking for comparative data on % of days/year reaching above-freezing temperatures at Snoqualmie Pass. Can you point me in the right direction? It never rains in California?